Earn 145 - 480 points upon purchasing this product. Use 1450 - 4800 points to purchase this product! This metal detox drink comprises 4 ingredients, Spirulina, Wild Blueberry, Barley Grass Juice Drink & Cilantro. The powder can be accompanied by Atlantic Dulse in the same day to help sweep the metals out of the body. By special request, we have also include the option for Mega Heavy metal Detox without Cilantro as some have wished to use fresh cilantro juice. Please see the drop down menu for this option. 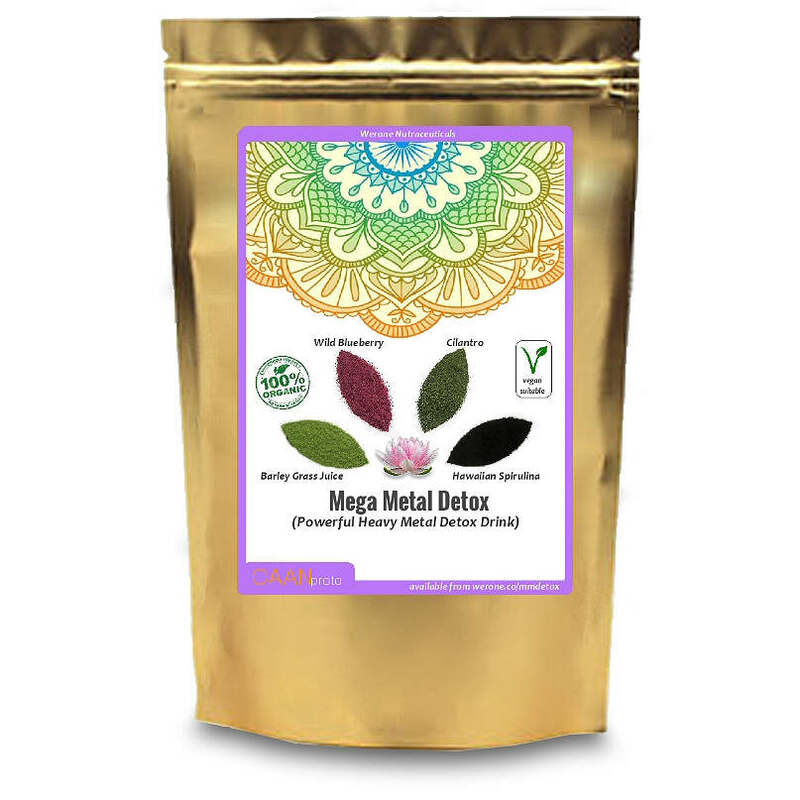 We also have a version of Mega Metal Detox with Atlantic Dulse included here MM Detox (Dulse Version) . Heavy metal toxicity, just like chemical toxicity, has become one of the most pressing health hazards of our day. Whether you recognise it or not, your body is assailed by chemicals and heavy metals on a daily basis. Toxic heavy metals such as mercury, aluminum, copper, cadmium, lead, arsenic, nickel, chrome, alloy, and steel are hidden antagonisers that can find their way into our bodies and wreak havoc through seafood, silver amalgam fillings, vaccinations and even inherited from our ancestors who were given mercury elixers by their doctors. The metals we may be dealing with comprise a group of dangers we are exposed to that threaten our health and well-being. If you want to heal from chronic illness and symptoms, removing the heavy metals in your body and brain is a good place to start. According to some experts there are five critical foods that you can consume daily to pull heavy metals out: Cilantro, Wild Blueberries (10:1), Hawaiian Spirulina, Barley Grass Juice Extract powder(6:1) , + separately add Atlantic Dulse Flakes or Dulse Capsules. Caution on Amalgam Fillings: As a precaution, Mega Metal Detox should not be used if you have amalgam dental fillings. Also be careful about rushing to have them removed if you are not in good health, this can be quite hazardous. Please seek professional advice on this if contemplating amalgam removal. Additionally if you have had them removed, only do so one at a time with a few weeks in between and wait a week before using Mega Metal Detox. Another powerful Metal chelator is Alpha Lipoic Acid with DMSA, which also perform the final stage of extraction similar to Dulse. ALA should not be used until 3 months after final extraction and DMSA 4 days after extractions, but please read the Andy Cutler chelation protocol which is well-known for Heavy Metal Toxicity and involves taking ALA every THREE hours and DMSA every fours hours, even during the the night, please read some background here , the Cutler protocol is here. Take 1 tablespoon (9g) mixed in water, coconut water, or juice. To improve the mixing, add just enough water to the powder to form a slurry, mix well before adding the rest of the water or juice. Additionally, drinking celery juice in the morning is highly beneficial. The mineral salts in the celery juice give extra support to the heavy metal detox foods by helping to flush metals out of the liver.